Le nozze di Figaro (The Marriage of Figaro) K492. Sung in German. There’s nothing new to the catalogues here. The Figaro first appeared, if memory serves, on Preiser 90203 in a two CD set. The Strauss miscellany was last available on Decca 425 990-2DM2 where it was harnessed to Krauss’s Die Fledermaus with its famous all-star cast of Gueden, Lipp, Patzak, Dermota, Poell et al. Coupling the Strauss items – Johann and Josef – to Mozart’s Figaro is on the face of it an unlikely proposition. Doubtless Andromeda has done it because the Mozart spills over to the third disc and some kind of filler was required – even so, it makes for rather patchwork listening. Collectors, those high-minded avians, will be fuming at the inconsequentiality of the pairing, though in mitigation I’m not aware that any other example of Krauss’s way with a Mozart opera has emerged. The performance is splendid. It’s energetic, lithe, well-paced and doesn’t stint emotive candour into the bargain. It’s sung, as was customary, in German and there is a piano continuo for the fluently taken and athletic recitatives. Perhaps it doesn’t plumb the greatest of depths but it assuredly skirts the excesses, musico-dramatic, that the opera sometimes received. It was given at the 1942 Salzburg Festival. The sound is not quite as good as many a wartime German broadcast – which is to say a whole lot better than most others from this period. Spatial definition and stage movement are both audible with clarity; no real complaints on this score, especially not when given the rarity of the material and the fact of its survival at all. The weight of cast excellence lies in the men. Kunz is Figaro and he strikes a warmly chiselled dramatic presence. This is character acting that transcends the medium with a voice that compels attention. He takes no time at all to warm up – fortunately – and by Non più andrai – or Nun vergiss leises Flehn as he sings it – we are in the presence of a cherishable document highlighting his Mozartian credentials. He is more than matched by the young Hotter whose Count is in truly commanding and youthful voice. No one would argue with his Cosa sento? and for an exhilarating example of his compelling characterisation turn no further than to Act II’s Esci ormai garzon malnato. He employs a suitably rich array of vocal blandishments and proves a crowning glory of the performance. The young Gustav Neidlinger is a fine Bartolo -warmly vocalised and rich of compass, albeit still a touch nasal higher up the range. The women are by no means disgraced but don’t quite operate at the exalted level of Hotter and Kunz. Beilke’s Susanna certainly has the top notes though hers is – maybe appropriately – quite a lightweight assumption. Helena Braun is the Countess and she offers an interesting study in the fluid use of portamento in Porgi amor. Res Fischer’s Marcellina is inclined to be a touch shrill but Gerda Sommerschuh as Cherubino offers plenty in the way of urgency and personality. The bonus consists of numbers from the Decca New Year concert, recorded in anticipation in September 1951. Krauss had started the concerts during the War and was to continue to do so until his death. He is of course delectable in this repertoire. He finds plenty of sauce for G'schichten aus dem Wienerwald. There again he brings out the woodland Idyll of the seldom-heard Die Libelle (The Dragonfly) and dispatches the whip-crackery of the Parisian sounding Jokey with veritable élan. No notes of any kind grace the box. But in conclusion and for those who do not already posses these recordings elsewhere this is a valuable historic document. 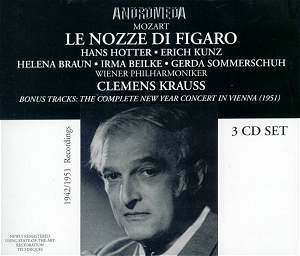 Figaro captures Kunz and Hotter in their primes and Krauss in rare repertoire for him – pretty well recorded too. The Strauss family New Year disc is self-recommending, thin strings and slightly papery quality notwithstanding.